Facebook is a complex beast. A beast that will eat us alive unless is it understood and tamed. SMBs (usually because of restrained budgets) often get left with low level agencies that still live in an Adwords world and haven’t really had the opportunity to embrace the possibilities that exists on Facebook. In this article I want to share some simple Facebook Ad Hacks that will help propel your campaigns and give them the best chance of success. Facebook Ad Hacks – No 1. Use Basic Automation To Pause Your Adset When they are having a poor day. A strange phenomenon exists on Facebook whereby, unless your service is VERY time of day sensitive, days that start badly, rarely recover. It is also true that unlike keywords within a search campaign, results do tend to sway wildly, so a great day could easily turn to a shocker the following day and vice versa. We suggest using 2 simple rules for your campaigns adsets (you can also set this at ad level). These two rules allow you to keep a watchful eye on your results. If your adsets are constantly pausing at 1pm, you need to rethink your COPy and possible your AUDIENCE. This may sound daunting and systematic. It isn’t. When you use the above automation, simply create a new adset with fresh copy and audiences every few days. You will weed out quickly what works and what doesn’t, meanwhile your rules are keeping a careful watch for you. Convert better than standard website clicks (In most cases). Have far quicker page load times. When you setup a campaign you tell Facebook that you would like to optimise for clicks, engagement, video views, impressions or a conversion point. Most direct response campaigns target conversions, however, if you have a compelling and shareable offer, you might also try optimising for engagement. There’s nothing better than free clicks from a shared post. It’s a low level referral after all. Facebook by default will set your ads to automatic bid. Whilst this has its place, it gives you no control over what you’d like to pay for a conversion. Using Max bid or better still setting your bids well above max bid, ensures you get suitable reach and decent positions in the feed. The last place you want to be is bogged down in lower feed where ctr is lower and your ad is amidst all the clutter. Tim Burd’s bully method is a theory that is working well amongst the closed FB groups. Facebook Ad Hacks – No 6. Remember that your perfect audience also has other likes. So many people see their audience one dimensionally. People by their very nature have interests in many things. 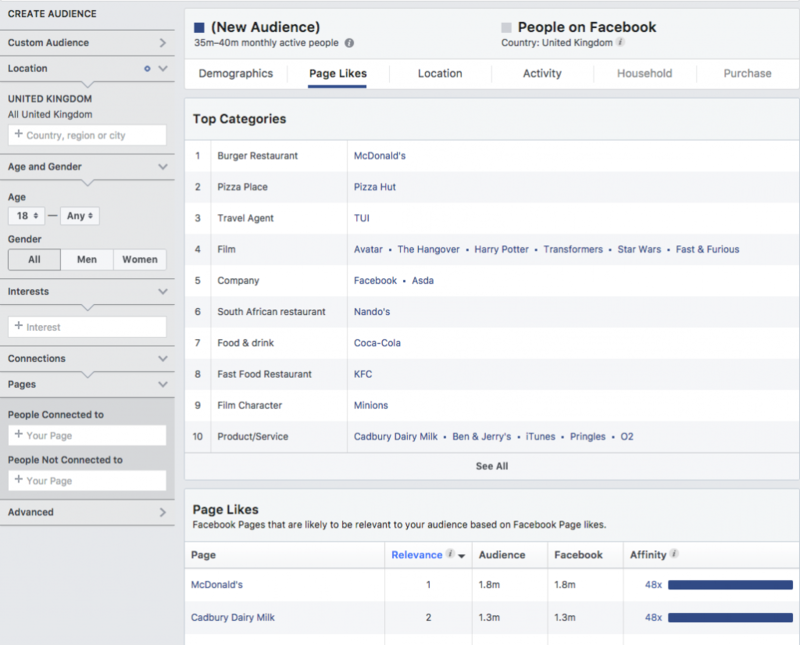 Facebook has a great tool called audience insights which shows you what your audience is also interested in. Go check it out. Facebook has endless possibilities, which makes it a gift and a curse. Take the time and try what they provide you with, question what your agency is actually doing for you and if all else fails, get in touch with me.